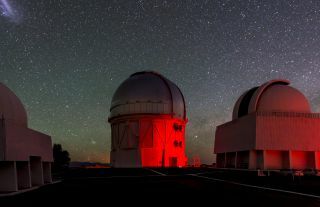 The Dark Energy Camera is mounted in the Victor Blanco telescope, pictured here with other telescopes at the Cerro Tololo Inter-American Observatory in Chile. SCOTT DODELSON — is a cosmologist and the head of the Department of Physics at Carnegie Mellon University. He is one of the lead scientists behind the Dark Energy Survey's new map of cosmic structure, which he worked on at the Fermi National Accelerator Laboratory and as a professor at the Kavli Institute for Cosmological Physics at the University of Chicago. RISA WECHSLER — is an associate professor of physics at Stanford University and the SLAC National Accelerator Laboratory, as well as a member of the Kavli Institute for Particle Astrophysics and Cosmology. A founder of the Dark Energy Survey, Wechsler is also involved in two next-generation projects that will delve even deeper into the dark universe. GEORGE EFSTATHIOU — is a professor of astrophysics and the former director of the Kavli Institute for Cosmology at the University of Cambridge. Along with his work on the Dark Energy Survey, Efstathiou is a science team leader for the European Space Agency's Planck spacecraft, which between 2009 and 2013 created a detailed map of the early universe. RISA WECHSLER: It does seem very strange that the results are good news, right? Forty years ago, nobody would've guessed that we apparently live in a universe in which most of the matter is stuff that doesn't interact with us, and most of the energy is not even matter! It's still super mind-blowing. Risa Wechsler's research uses computer models and numerical simulations to chronicle the evolution of the universe from the Big Bang through today. But we've kept making increasingly precise measurements of the universe, and that's where the Dark Energy Survey results come in. They are the most precise measurements of the density of matter and how it's clumped in the local universe. In the past, we have measured the density of matter in the young, distant universe. So the Dark Energy Survey is really allowing us to test our understanding of the universe's evolution, which we've formalized as the standard model of Big Bang cosmology [See sidebar below: "A Cosmic Recipe"], in a totally new way. Still, it's certainly possible that we may have something wrong. Scott Dodelson focuses on the intersection of cosmology and particle astrophysics, where the largest cosmic structures ultimately come about due to the behavior of the tiniest particles of matter and dark matter. GEORGE EFSTATHIOU: Those measurements of the matter and energy in the young, distant universe that Risa referred to were obtained just a few years ago, when a different program called Planck looked at the relic radiation of the Big Bang, which we call the cosmic microwave background. Although the Planck spacecraft's measurements support the model we're talking about, one is always uneasy having to postulate things, like dark matter and dark energy, that have not been observed. That's why the Dark Energy Survey is very important — it can stringently test our knowledge about the birth of the universe by comparing it to the actual structure of the modern-day and young universe. TKF: The Dark Energy Survey kicked off four years ago, so you've been waiting a long time for these results to come in. What was your initial reaction? DODELSON: It was the most amazing experience of my scientific career. On July 7, 2017, a date I will always remember, we had 50 people join a conference call. No one knew what the data were going to say because they were blinded, which guards against accidentally biasing the results to be something you "want" them to be. Then one of the leaders of the lensing analysis, Michael Troxel, ran a computer script on the data, unblinding it, and shared his screen with everybody on the call. We all got to see our results compared to Planck's. They were in such close agreement, independently of each other. We all just gasped and then clapped. WECHSLER: I was on that conference call, too. It was really exciting. I've been working on this survey since we wrote the first proposal in 2004, so it felt like a culmination. TKF: In 2013, Planck gave us a highly accurate "baby" picture of the universe. Now we have a highly precise picture of the universe in a later epoch. George, you were a leader on the Planck mission. What do you see when you look at these two different snapshots in time? EFSTATHIOU: The "baby" picture is consistent with a universe mostly made of dark matter and dark energy. It is also consistent with the idea that the universe underwent an exponential expansion in its earliest moments, known as inflation. So how does the baby picture extrapolate to the modern, "grown up" universe? As the new Dark Energy Survey results show, the pictures are remarkably consistent. George Efstathiou is interested in both observational and theoretical cosmology, including studies of large-scale structure, galaxy formation, and the cosmic microwave background. DODELSON: We're all astonished that these two pictures agree to the extent they do. Here's an example. Let's say you bought Berkshire Hathaway stock in 1970. Say it was $10 a share then and today it's $250,000 a share. If you were to predict back then that today it would be $250,000, plus or minus $1,000, people would've thought you were nuts. But basically, that's what we've done. When the universe was very young, only 380,000 years old, it was also very "smooth." Matter was so evenly distributed. Today though — more than 13 billion years later — matter in the cosmos is highly, highly clumped in galaxies, stars, planets and other objects. This is what one would anticipate with cosmic expansion, and with the Dark Energy Survey, we've been able to confirm the prediction of this cosmic unevenness to a remarkable degree. WECHSLER: What's really helped us make the precise measurements with Dark Energy Survey is that for the first time, we're looking over a much larger area, about one-thirtieth, of the sky. That's three or four times larger than the largest dark matter map we have ever made before. We are also able to make that map essentially over half the age of the universe, from now until about seven billion years ago, by collecting light shining from distant galaxies. So we're able to tell this story over half of the universe's history, and it remains consistent throughout. EFSTATHIOU: It would've been very interesting if the results had significantly increased the tension with the cosmological standard model, which is the foundation for understanding why, beginning with the Big Bang, the universe is undergoing an accelerated expansion. Some previous surveys had suggested that there might be a problem, though I thought that these results were questionable. In my view, one should rely on the data and not be alarmed if our theories disagree with observations. The universe is what it is. TKF: Yet a Nature News story characterized George's view on the discrepancies as "worrisome." EFSTATHIOU: Well, yes, there have been some claims of tension between the clumping measured in the local universe and Planck's observations of the distant universe. Some other observations have suggested that the late-time, local universe is expanding at a faster rate than expected from Planck. If we were able to say convincingly that there was a real problem posed by any of these individual pieces of data, then we'd have to abandon our standard model of cosmology. We would need new physics, and the sort of physics that we would need would be in the exotic territory, overturning decades of otherwise independently supported physical laws. So it's a big deal. In the past, these sorts of tensions have come and gone. When we wrote the 2013 Planck papers, the results then were in tension with most of astrophysics. Then two years later, some of these tensions had disappeared, and now in 2017, they've re-emerged. So these things come and go. We need to set a high threshold for our science before launching into explanations based on new physics. TKF: It almost sounds like, "if it ain't broke yet, don't fix it." EFSTATHIOU: We need to be sure it's broke before fixing it. WECHSLER: I agree with George. There's a very high bar to show you really understand all of the potential sources of error before taking the big leap of abandoning our current, well-evidenced conception about the universe. I don't think we're there yet. It means that we should be really excited about the continuing Dark Energy Survey, as well as all the other upcoming surveys and projects. TKF: Indeed, these new results are based on a year's worth of measurements out of a total of five years. What might we expect after four more years of data have been crunched? WECHSLER: With four times more data, our map of dark matter will be even more precise. I also expect there will be improvements in our analysis methods. There will also be a bunch of other new things that the Dark Energy Survey should discover, including new dwarf galaxies around our Milky Way galaxy that we've long thought must be there but couldn't find. There's lots more to look forward to! DODELSON: The increased precision Risa just talked about will enable us to hit the standard model of cosmology as hard as it's ever been hit. Disproving the current model will revolutionize the way we think about the universe, so that's the most exciting thing that I can imagine happening. TKF: How are astrophysicists extending the hunt for dark matter and dark energy? Risa, let's start with you, because you are closely involved in two next-generation "dark universe" projects. WECHSLER: With the Dark Energy Spectroscopic Instrument, or DESI [pronounced "DEZ-ee"], we'll be getting what we call spectra, or detailed observations of the light from about 35 million galaxies and quasars, which are galaxies that appear extra bright because their central black holes are actively devouring matter. That's about 10 times more spectra data than we've collected from all instruments, so you can imagine that will be really transformative. With DESI, we will be able to independently measure the universe's expansion rate and how fast its structure of matter and dark matter grow, both of which are influenced by dark energy. Then when you compare those measurements, you get a precise test of the physics governing the universe. DESI will start in 2019 using a telescope in Arizona. The other major new instrument I'm working on is the Large Synoptic Survey Telescope, LSST. It will make observations just like the Dark Energy Survey, but at substantially higher precision. In fact, it will cover about four times more area, and the billions of galaxies it sees will be much deeper and farther away. LSST will be a new observatory, being built in Chile right now, and it's scheduled to begin in about 2022. EFSTATHIOU: One of my hopes for Planck was that the standard model of cosmology would break and it didn't. But wouldn't it be absolutely great for cosmology and for physics if this happened? So we should plug away and see. Maybe we'll be lucky. DODELSON: We're living in an era of cognitive dissonance. There is all this cosmological evidence for the existence of dark matter, but over the last 30 years, we've run all these experiments and haven't found it. My bet is that we're looking at things all wrong. Someone who's 8 years old today is going to come around and figure out how to make sense of all the data without evoking mysterious new substances. EFSTATHIOU: I wouldn't put a bet on any specific candidate for the dark matter. But I bet that dark energy is the cosmological constant, a fudge factor invented by Einstein describing the density of energy in a vacuum. I think it's very likely that 15 years from now, we will just then be measuring that dark energy is caused by this cosmological constant. We will be able to shrink the error bars and find that our present model still works. On dark matter, I think it's much less clear. For a long time, the most popular candidate was this thing called the WIMP, or a Weakly Interacting Massive Particle. That idea is still popular and totally possible, but a lot of the particles that could be that kind of dark matter are already ruled out. The other really compelling candidate is a subatomic particle called the axion. People are just getting to a place where they're able to start searching for these particles that we think are going to be extremely difficult to detect. It's also possible that dark matter might surprise us, that it's some new kind of particle that we don't have the techniques to look for yet. What our universe is made of. SIDEBAR: A Cosmic Recipe: In recent decades, scientists have settled on a model of a universe that is mostly unseen and unknown. Known as the standard model of Big Bang cosmology, it stipulates that matter as we know it — comprising people, planets and stars — is only around 4 to 5 percent of the total cosmic composition. Around 26 percent of the cosmos is dark matter, thought to be made of massive particles that do not emit light and only weakly interact with normal matter. The rest is dark energy, a force that is accelerating the expansion of the universe and constitutes nearly 70 percent of reality. All these cosmic ingredients trace back to the universe's origin in the Big Bang, approximately 13.8 billion years ago. Follow all of the Expert Voices issues and debates — and become part of the discussion — on Facebook, Twitter and Google+. The views expressed are those of the author and do not necessarily reflect the views of the publisher. This version of the article was published on Space.com .